I always loved the run up to Christmas, with all the indicators that the big day would soon be upon us. It was getting colder of course, and darker earlier, and all the shops started to display their Christmas decorations (though I’m sure they never used to hang them up as early as they sometimes do these days). One of the first signs that Christmas was coming was the arrival of the trailer advert that showed all the films that a channel would be boasting come Yuletide. This was a time when we didn’t have satellite TV and therefore channels devoted to playing movies, which meant that it often took several years after their box office releases before films finally made it onto TV. Christmas was therefore a time when the TV channels had a captive audience, and so the majority of movie premiers occurred during the Yuletide break. The advert was thus always very exciting as you made a mental checklist of all the films you wanted to see. There was also another similar trailer advert showing all the Christmas specials of various TV shows that you could look forward to watching whilst waiting for the turkey to digest. As soon as the Christmas editions of the TV Times and Radio Times became available I would then scour the pages of them to identify all these wonderful films and shows I wanted to watch, and would note down when they were on, which channel, and how long they were, so I could also make sure I had enough video tape space to record anything I wanted to keep. Not that I knew they were called Idents back then (indeed, they may well not have been called that until recently) but another change that occured to the TV was the introduction of the Christmas Idents. These are the little snippets of film or animation that TV stations play whilst the announcer tells you about the next and following TV shows. These days the complexity of TV channel idents has become quite extreme, with Channel 4 in particular having some very impressive examples, but back in the Eighties we were just as impressed by the TV station logo just having a layer of snow across the top of it. The sorts of products that got advertised in the run up and after Christmas also changed, and as a kid one of the most notable changes was that toys suddenly started to be advertised. Hard to believe (and it is possible my memory is wrong on this point, but I don’t think so) but toys just weren’t advertised on TV for the rest of the year. I guess TV advertising cost a whole lot more back then so advertising toys just wasn’t cost effective for manufacturers during the rest of the year, as I believe far fewer toys were bought outside of the Christmas period that are bought today. Other products that started to be advertised before Christmas were things like fragrances and soaps (I’m thinking of the Yardley adverts in particular, but also Brut 33, Denim and Old Spice), alcohol (Harvey’s Bristol Cream with Hinge and Bracket, and QC Sherry), and sweets (Quality Street and Roses). After Christmas you were then bombarded with all the adverts for various department store sales, which I guess we still get now, but you also quite often saw a lot of adverts for more local independent stores that wouldn’t bother to advertise on TV at any other time of year, again due to the prohibitive costs involved. Of course this still occurs today, although I think the schedules possibly return to normality a little quicker now. 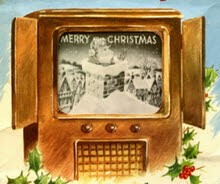 It also seemed more of a marked difference as the handful of channels we had back in the Eighties all changed dramatically around Christmas, whereas now a lot of the satellite and cable TV channels may only feature a temporary blip of changes before returning to their normal offerings. This entry is filed under Memories, TV	and was posted on December 7th, 2011. You can follow any responses to this entry through the RSS 2.0 feed. You can leave a response, or trackback from your own site. I do remember the airing of Indiana Jones And The Temple of Doom one xmas right after the Queen’s Speech – caused such uproar the BBC were forced to apologise and promise never to show someone getting their heart torn out during family holiday primetime again!